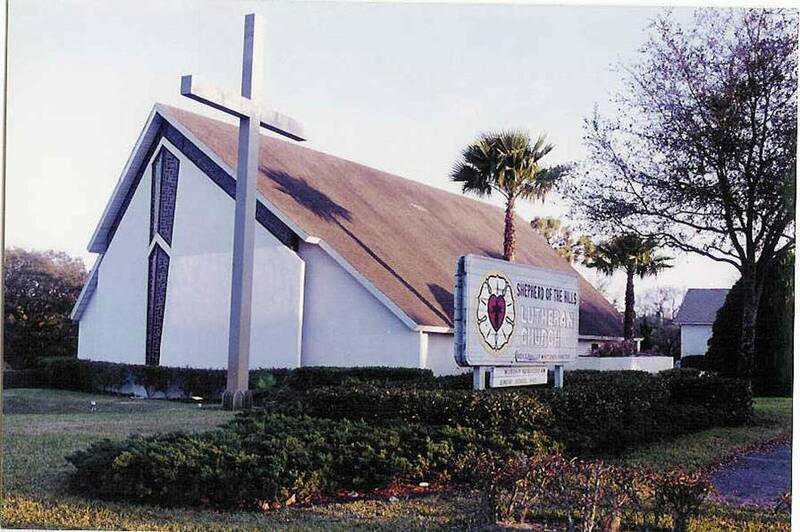 In February 1951, a group of displaced Lutherans from Clermont held the first meeting to give serious thought to establishing a worship center and possibly a Lutheran congregation in Clermont. Despite a variety of synod affiliations, they all had one thing in common - their faith. Beginning on October 14, 1957, local Lutheran Pastors provided the leadership to hold regular worship services in the Clermont Community Building. Over the next 18 months regular worship services continued. 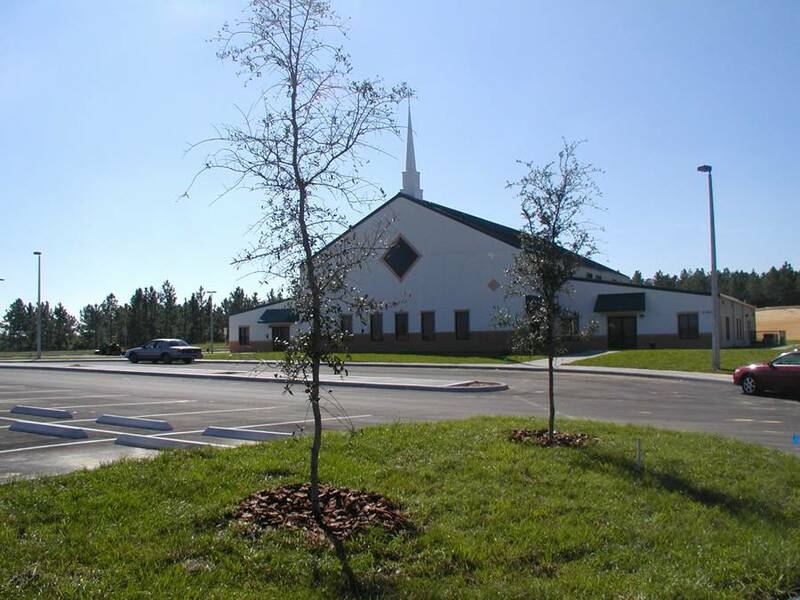 On October 25, 1952, thirty two charter members formed the First Lutheran Church of Clermont, a daughter congregation of Zion Lutheran Church in Groveland. The search for a pastor and a church home began. Zion Lutheran Church graciously agreed to share their pastor, Rev. Martin Swanson, with our church. He was installed as pastor on April 12, 1953. On December 1, 1953 (for $6,000), the church purchased 4 acres of property at Chestnut and Second in Clermont. 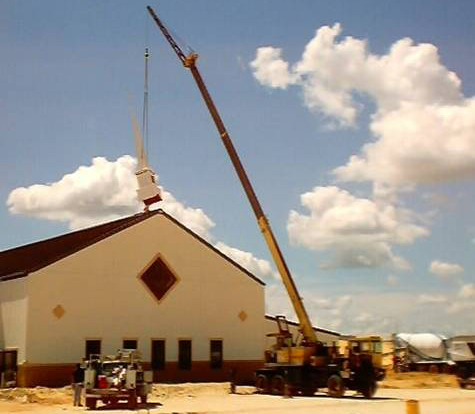 During this time, Zion Lutheran in Groveland erected a new church building. First Lutheran Church bought Zion Lutheran's original church building. 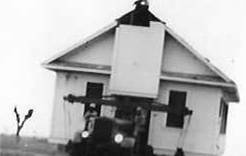 In December 1954, the entire building came down a dirt road, highway 50, on a special vehicle to the Clermont property. The first worship service in our first church home was in April 1954. On December 12, 1954, the church was dedicated. Church growth during the ensuring 15 years prompted the next construction phase: adding Sunday School class rooms, a social room, a nursery and a storage area - costing $22,000. November 23, 1969 marked the dedication of this Parish Hall. On April 7, 1974, the Garden of the Flags was dedicated.Flags of all 50 states were flown every Sunday. The White House in Washington sent us a letter congratulating our congregation on this special patriotic endeavor. In 1984 the garden had to be sacrificed for a much needed parking lot. due to congregational growth. Despite only a part time pastor for the first 25 years, growth of the congregation continued in the small rural town of Clermont. Growth continued from 1978 through 1981. 0n January 25, 1981, the congregation voted to separate from Zion Lutheran and called Pastor Becker. He was installed as the church's first full time pastor on October 10, 1982. 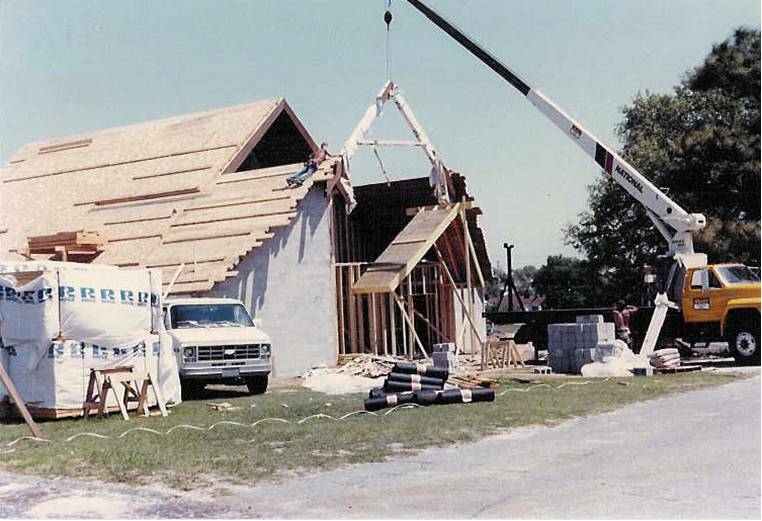 As a now independent mission congregation the church was faced with many challenges, but was blessed by continued growth and entered a building program in 1984. As part of the growth and new vision, the congregation changed its name to Shepherd of the Hills Lutheran Church in October 1984. The last traceable charter member, Mrs. Irma DeNeve, died July 26, 1986. 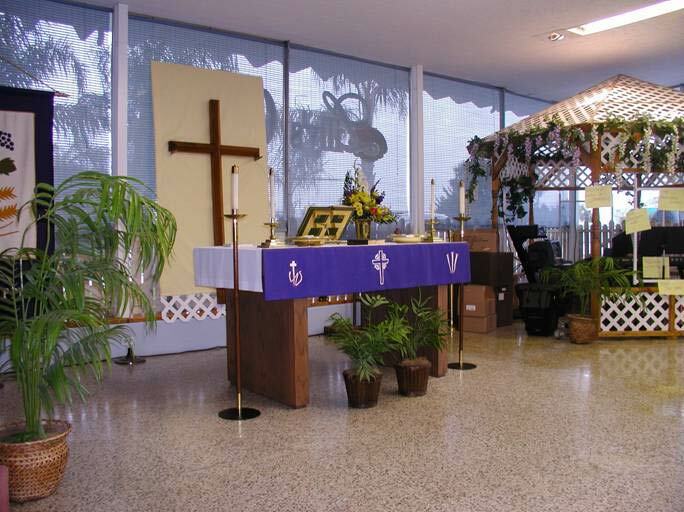 The Highway 50 Sanctuary, seating 220, was dedicated on November 30, 1986. The first Sunday School classes were held in the newly remodeled fellowship building in September of 1987. During the mid-to-late 1980's, several important changes took place in the community. As unseasonably cold winters caused havoc for our citrus farmers, the community of Orlando was fast growing into a major metropolitan area. By the early 1990's, Clermont had become a rapidly growing bedroom community of Orlando with building construction, tourism and new business having replaced citrus as the economic base for the city. Under the leadership of Pastor Philip Whitener, the church grew to two worship services and filled Sunday School classes. The congregation would soon outgrow its Highway 50 location. In 1995, they took a leap of faith and began "A New Hill for the Shepherd's Cross" capital fund campaign. Many sacrificed for our church's future. Despite 18 months without a regular pastor in the middle of a 3 year capital fund drive, 76% of the amount pledged was contributed. This money purchased 12.8 acres of property overlooking Highway 27 just south of Clermont for $275,000 prior to the Clermont land boom. In 2002 another church paid $450,000 for just 5 acres in the same area. Our congregation called Rev. Jonathan C. Ostenburg on Palm Sunday, 1997. On June 8, 1997, Rev. Kathryn Baines installed Pastor Jon. Our congregation continued to be blessed with growth that kept pace as the community grew. Retirement communities now sit side by side with new family communities. Over 1998-1999, our church averaged 40 new members per year. During 1998 and 1999, the Future Planning Committee began wrestling with the growth projections and current and future needs of our congregation. They restudied the option of remaining on the Highway 50 property. Such a plan did not meet the future needs of the church. Once again, it was time for a new church home. On April 11, 1999, the congregation voted to accept a sales contract on the Highway 50 property. In spring 1999, Walt McCarty led a building task force that began to design a new sanctuary. In the fall of 1999, a 3 year capital fund drive 'Now is the Time" began. We had to be out of the highway 50 building by March 2002, or pay $8,000 per month rent. So began our sojourn to our new church home. Our church leaders found a store front under the biggest steeple in Central Florida, the Citrus Tower. 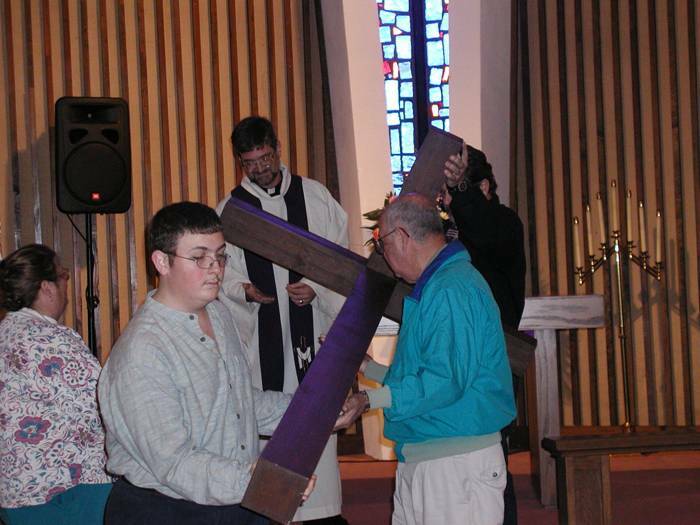 The first services were on March 3, 2002. Sunday School met in the Citrus Tower Lobby until the other stores opened. Due to space limitations, Easter worship was conducted at Jenkins Auditorium. Although cramped, this was truly God's House and Home. His peace was felt. God's many blessings were very evident during this journey to our new church home on Highway 27. We learned two things during this time; to keep the faith and that God will provide in God's time. Aagard McNary Construction company began construction on the new building in May 2002. Walt McCarty was appointed Building Chairman. Approximately six months later the building was completed in late October. On November 17, 2002, the first worship services were conducted and Sunday School classes held for the first time in our new church home! Our church now seats over 400 people. We gave special thanks and praises to our God for this new home at our first Thanksgiving Eve Service, November 27, 2002. Over 350 attended Christmas Eve services, during a severe thunderstorm. Despite being in a temporary location for 9 months in 2002, our church continued to thrive as new members and winter visitors continue to bless us. Sunday School offering classes from preschool to adult. Seasonal services also continue to be held.In the spring of 2016, Pastor Dennis Schmidt was called as the new pastor. Rev Schmidt has previously served in several churches in Florida and Oregon. A new council has been formed and new method of worship have begun including an Informal Wednesday worship. The church is continuing to grow and prosper. In September 2017, the church was damaged by roof leakage from Hurricane Irma. Significant repairs were necessary to put the church back into a good condition.